A majority of us often question & wonder about various aspects of our lives, society and community,yet we barely get any convincing answers. We’re forced to accept answers that we receive, which could be based on myths or partially true. We live amidst a society of differences, yet we barely question why differences exist. Children being naturally more curious than adults often get more confused and may often receive biased answers. We call ourselves secular, diverse, and democratic yet, we don’t see them being applied in our daily interactions with others where A situation like this is becoming a huge threat. We tend to accept things as they are, act blind to the actual problem, easily place blame for societal problems on others or systems without realizing that change begins with us as individuals. We need to introspect &make changes before pointing fingers at another. We should be able to accept the differences and celebrate them, and that can happen only if we stop tolerating and wholeheartedly accepting the differences around us. Blink Foundation is a not for profit organization placed inside Loyola College which aims "To Nurture a Society that Celebrates the Dignity of Differences". It looks to do away with existing societal prejudices and help people celebrate differences. It is a non- parallel platform, bringing together school students and renowned Scholars from all over the world through an online discussion portal.To achieve this, Blink enables action through both contact and content by offering Value Education programs in schools. Blink programs are unique in design, scale and scope, as they integrate human centric pedagogy and Information and communication technology to inculcate value education amongst children and youth. The objective is not only to build a culture of peace and tolerance, but to enable them to convincingly celebrate the dignity of differences, for social and human development. Blink Foundation seeks to create a better society, starting with today's children and tomorrow's adults by conducting value education classes at various schools. These classes are conducted by trained college students, who in the process, learn analytical thinking and leadership skills. This enables to connect young minds and answer any questions they may have in, fields such as religion, culture, social psychology, environment, health and so on. Blink attempts to help the younger generation view the society from a different perspective through questioning the existing patterns in the society, as a way to stop tolerating and promoting acceptance by understanding what goes behind a belief system, habits and behavior patterns. We follow the young teach the younger pattern(Y to Y). 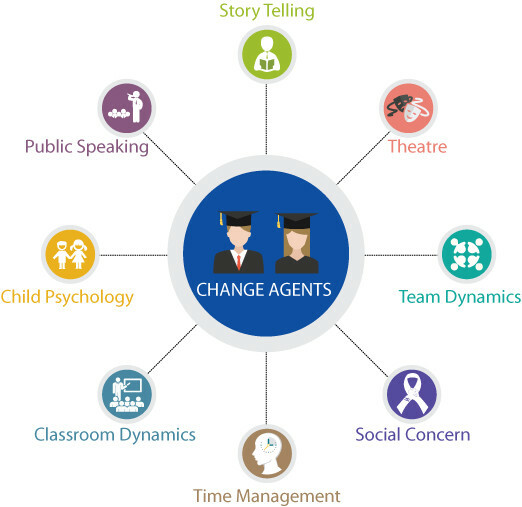 Change Agents are essentially college students who join Blink and undergo training in public speaking, team building, time management,storytelling, psychodrama, theatre and other interactive methods, to aid them in taking value education sessions with school children.The value education classes the Change Agents take are called Change Classes. Change agents are recruited through campaigns, referrals, and through Blink Cells in colleges. Apart from this, each CA's undergo various level of training & development during their time in blink to enhance their skill sets. Change Agents are selected post a rigorous training and interview process. In order to provide these young collegians with a robust training, we partner with field experts to train volunteers in storytelling, debating, theatre, and public speaking. Volunteers who join Blink are trained and taken in as Change agents. On joining as change agents, they facilitate Change Classes (Value Education Classes) for students at both government and private schools. Schools today provide academic knowledge in a well versed manner, yet how it gets assimilated and self-reflected in questionable. School children often lack platforms to question and expand their perspectives, unless encouraged to do so. Change Agents are assigned various schools to teach value education classes also called Change Classes. They take activity and interaction oriented sessions on Social Concern, Morals and Values, Religion, Culture, Environment and Health. A change agent helps facilitate an environment where children are interested to learn as opposed to a normal mainstream class. The reasoning behind such a programme was that we strongly believe that smaller the age gap, better it is to communicate. Children generally look up to their seniors with aspiration to learn and achieve, hence enabling better interaction for developing understanding. Through Change Classes Blink provides students a space to inquire and broaden their perspectives and enable learning to be, more holistic rather than narrow in narratives. The program runs on the belief that it would also support young college students who, didn’t get this kind of learning experience and yet yearns to learn and give back to the society. * Enhanced socio-cultural development and co-action among school and college students. * Improvement in the Emotional, Creative, Social and Intelligent Quotients of the school students. * Bring forth systematic thought processes of probing, analyzing and self -reflection within students. * Enhanced Mutual respect between Girls and Boys. * Reduced fighting and aggressive behaviors between the students. * Visible changes in personal presentation and development. 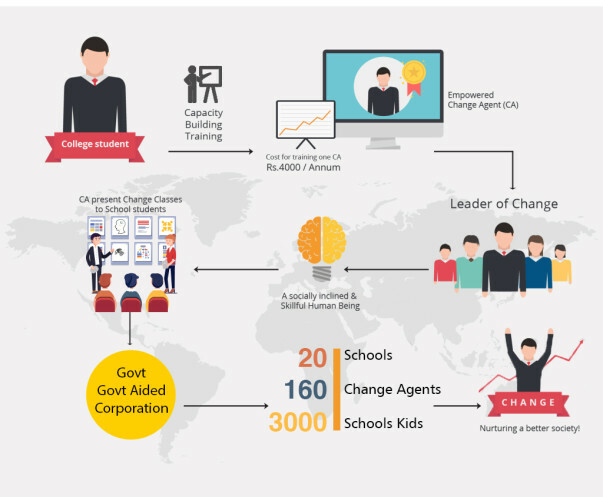 Change class Programme has ran in around 13 Government aided & Private Schools, 2 Government Schools and 1 Rural School teaching about 6293 School students of standard 6th, 7th, 8th & 9th through 186 Change Agents. In Addition to these Change Classes, we have also reached out to around 23 Schools teaching Child Rights to about 1842 students through 48 Change Agents. In total we have reached out to around 376 Change Agents through our various programs, who have imparted the notion of celebrating dignity of differences to the students. As adults we see around us , various sociopolitical issues that create strife, misunderstanding and yet we this is a chance for you to contribute in your own ways to support us in our initiatives. Blink is a relatively new organization with a massive youth base supporting it. It takes an estimated amount of Rs 4,000/- for training a Change Agent and Rs. 300/- for conducting change classes for a child throughout the year. We seek to train around 160 College students this year in order to achieve our objective of reaching out to nearly 3000 school children from around 20 different government, government aided and rural schools. We see your contribution as essential in helping us to sustain and thrive in our initiatives and is highly appreciated.